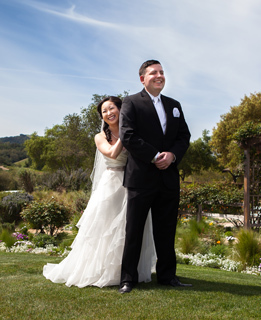 We do Wedding Photography in the Bay Area Since 1994. We are located in the heart of Silicon Valley, in the city of San Jose. I believe that Pictures have the magic of stopping moments and make them timeless. Our style is unobstrusive, truly journalistic, and never forgetting a few traditional posed images when is time. “Our focus is… you” … I believe that my role as Wedding Photographer is to capture your personality, emotions … Our Focus is truly YOU. Whether funny, silly or serious, I will be there for you. That is why from the moment we meet, I am all ears. I am interested in you, your plans and ideas for your wedding. My goal is to capture the essence of you plans for your wedding or photography session, with an artistic touch. Soon after Booking your wedding with us, you will receive a guide and a form to help you plan your Wedding Day. This is a great tool that we offer to our Brides and Grooms to help you get organized, and to keep everything in one central place. This will be an easy to reach and handy tool. If you have a Wedding Planner; we will be more than happy to coordinate with her/him. First of all, It is all about YOU. Many of my Brides and Grooms like to do the First Look, many also want to have an outdoor aerial group picture…etc. This tool will help you allocate these and other events in your schedule. My suggestion is to make all decisions during the planing stage, and just have Fun and enjoy your family and friends on the Wedding Day. Two Weeks before your Wedding or event, we will meet in person (optionally on the phone) and go over the final details of the Wedding. All events on the day, we will talk about final decisions. Special requests for the event. For example.. “My brother is serving in the Army and will come specially for my wedding” or “My best friend has made this beautiful center piece for us” or “My niece and nephew will be there I would like you to capture them”…. you get the idea. I am interested in hearing what is important to you. This will also define the style or styles that I will use on your wedding. Currently we mostly use a combination of Documentary, True Journalistic, and Formal Styles. Short training on “Posing 101” for natural look. My number ONE goal is for you to look Natural, so my focus is in refining the pose, I stay away from asking you to make awkward poses…. they do not look natural. STEP 3 ... THE WEDDING DAY...!!! We normally arrive to our events 15′ to 30′ before our scheduled time just to make sure we do not run into any unexpected. We Dress according to the occasion. let us know if any special code is in place. I normally go in Suit, however a few times I have been asked to go in Hawaii Style for a Hawaiian theme wedding. Let us know what is best for you. During the first part of the Wedding we take the lead and go over the Schedule of the day as planned, until all the formals are finished. The Ceremony is usually coordinated with the WC, from that moment we coordinate with the MC, DJ, or WC about the events on the reception. I like being organized for my events. However, we do not need to be rigid in following the schedule to the minute, we are flexible… the Main thing is for you and your guests to enjoy the Wedding Day, It will be a great unforgettable day. After the Wedding Day, for safety, we Store the images in three different places, and focus in processing the images. Color correction, balancing them, general editing, etc. all technical stuff. Two to Four weeks later we will send you a link and a password for you to preview the images and you will have control of who preview the images. Six Weeks after the Wedding you will receive a second link to download all the High Resolution Images. You will have one week to download them, we recommend to make back up copies. In case you loose your images, No problem, we will send you another link to download the Images. We guarantee saving all images for 12 months after the wedding. As soon as you get the link to the preview, you will also receive a form to start selecting your images for your Album. I will use the images you select to custom design your Wedding Album. After you send us your Image selection, It will take me about 4 Weeks to create a full layout of your Album. You are welcome to suggest changes to the original layout. My Goal is to create the most beautiful design for you. Once you approve the Album layout, we will prepare it for printing and manufacture. We will get it back in about 4 to 6 weeks. Do you do Engagement Sesions? I certainly do. As a matter of fact I encourage everyone to do engagements sessions. Engagements are great to show prints on your wedding day, also they are good because they get you used to be in front of the camera and make a good connection with your Photographer. Typical Locations for Engagements are our Beautiful coast, around Half Moon Bay, Monterrey, Montara and San Francisco and also a few beautiful Parks in San Jose like Vasona. The Price of the engagement Session is $400 and we usually take one to two hours. Are all images touched up? Additional Touch up like blemish removal is also available at an additional cost, However this extra cost is voided for all images included in the Album, of for print enlargement purchases. How soon after the wedding will I see the Preview images? You will see the Preview Images 2 to 4 weeks after the wedding. This depends on the amount of work we may have, or the number of weddings we have to process at the moment. At this time you will get a link and a password to our Online preview, you are welcome to forward this Link and password to your friends and family. So it is up to you who has access to preview the images. All these images will have our Logo in the lower area and if they are used in any Social Media like Facebook, we would certainly appreciate keeping the Logo and a referral link to our site. Six weeks after the weeding you should be receiving a link to download all images in High Resolution. These images do not have our Logo and you have the right to print these images or share them. However you can’t sell these images without written authorization from Abel Soria. I would like to book you, but I live outside California... How can we meet? Thanks to technology we will be able to meet online. We will save some time for you, just like meeting in person, and we can go over your plans for the wedding, you can all the questions you may have, we will be able to show you events similar to yours, or with similar requirements. And we can go from there. Then we can email you the Agreement, and you can send it back properly filled, signed and with the deposit. The date is saved as soon as we receive the signed agreement with the deposit. Can I see a full event ... from start to finish before hiring you? Certainly you can. Actually, I encourage everyone to preview a full Wedding, not just online samples. Lets have a personal meeting and I will find the perfect match from another wedding to preview in my Home. Make sure to bring your Fiance or your Mom or a good friend so you both can ask all the questions you want. What Album Options do you offer? I have the most beautiful Albums, ranging from middle price to luxury options. All of them with great quality. I have worked with several Album Vendors including a few Popular Overseas manufacturers. However I have learned that the most quality and durable options are the one manufactured in the USA, and these are the ones I currently offer. I am ready to book, What do I do? That is great… send us a message to abelsoria@specialmemoriesca.com or use the contact form located at the end of the page. Do you do Small Weddings or Anniversary Celebrations? We frequently go to the San Francisco and San Jose City Halls, and offer packages that cover the Ceremony and formal images at a local park, where you can have family and a few guests for images. We also offer Anniversary celebration coverage. Typically these events take 4 hours coverage. Contact us for more detailed information.